Kate Williams has been employed by the Network since March 2010 and became Network Coordiantor in October 2015. Kate is passionate about working with the community to build capacity for sustainable land management. Kate is currently employed for 2.5 days per week. 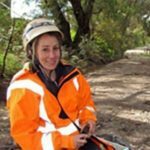 Prior to working with the Network, Kate has fulﬁlled environmental roles within State and Local government in Victoria (VicRoads and Mitchell Shire Council). Past and current roles have focused on pest plant and animal extension/education, land management and environmental project management. Kate has Bachelor of Environmental Science majoring in Conservation Ecology (Deakin University) and Diploma of Environmental Management (Swinburne University of Technology).